More than 80% of the almost 600,000 Syrians in Jordan live in urban areas outside of refugee camps. With no sign of the conflict ending, local and international NGOs are trying to help Syrians cope with daily life. Here, nonprofit ARDD-Legal Aid shares a photo essay from one of their discussion sessions with a small group of refugees. They provide post-trauma coping skills and basic family counseling, in an attempt to give the families a semblance of normalcy. 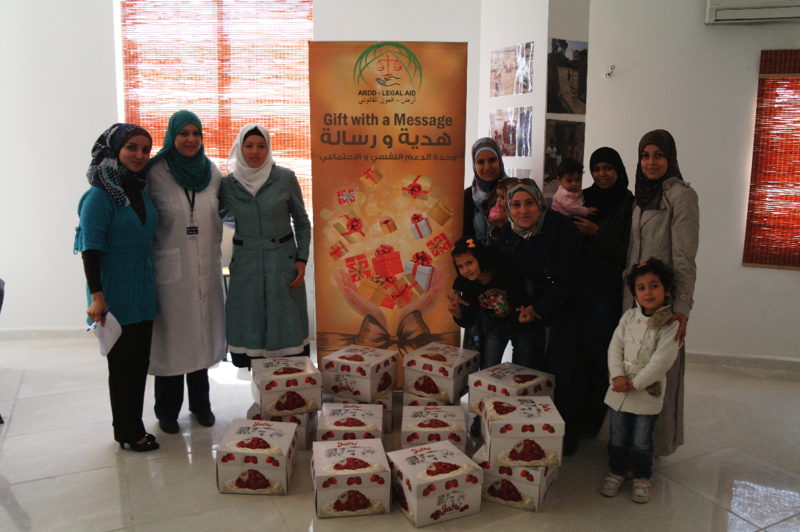 Jordanian psychotherapist Dr. Lina Darras of ARDD-Legal Aid meets with Syrian women in Zarqa, Jordan. ZARQA, Jordan – A party is being held on the third floor of a building behind a busy street in Zarqa, Jordan. Three girls, two boys, one baby and three mothers are gathered around a cake at the center of a plastic table, piled high with strawberries and crowned with one tall white candle. The baby is sleeping, boys are dueling with balloons, mothers are fussing over plates and forks as two of the girls hum Syrian songs to themselves. The third leans her elbows on the table, quiet, a mountain of strawberries reflected in her eyes. The women are Syrians from Daraa and Damascus, now refugees and newfound neighbors. They came to Jordan about a year ago, first staying in the Zaatari camp and then leaving when the water started to make their children sick. Now they live in Zarqa, an industrial city 45 minutes out of Amman, getting by on UNHCR-issued food coupons and their husband’s informal salaries from clothing shops and Syrian ice cream stores. 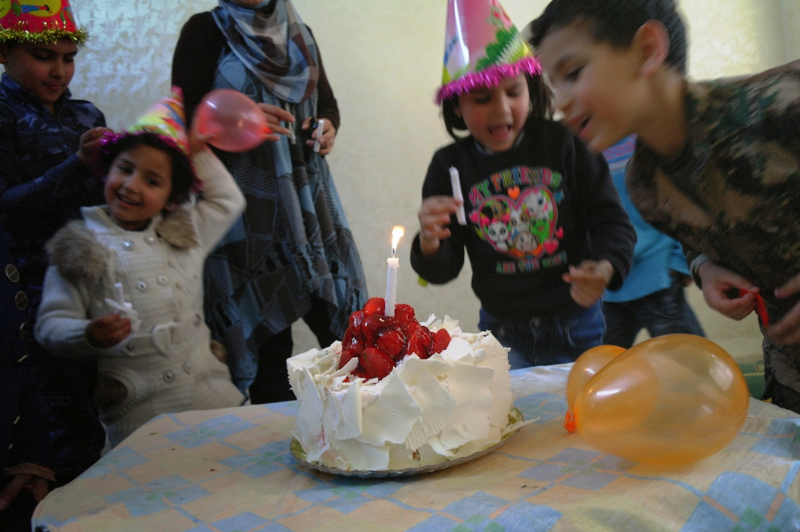 Syrian children at a family party in Zarqa, Jordan. This session is part of “Gift with a Message,” an initiative to first counsel and then empower participants to build psychological health in their communities. After a session on “Helping Children Cope” last week, Syrian parents brought toys back home for their sons and daughters. In a session on violence against women, husbands were given gifts to honor their wives. Today’s topic is “Managing Stress in Couples,” specifically how marital roles change in the refugee context and how women can support their husbands and families nonetheless. The gift for each woman – and in extension, her family – is a strawberry cake. ARDD-Legal Aid psychotherapist Dr. Lina Darras meets with Syrian women and children in Zarqa, Jordan. “How did the war affect your relationship with your husband?” ARDD-Legal Aid psychotherapist Dr. Lina Darras begins the conversation. Twelve Syrian women are gathered in a circle of chairs around her. It’s 12 p.m., but the shades are drawn, with music playing and candles lighting the room. No daycare is available, so half the women have brought their children, breastfeeding infants and shushing toddlers who whine about needing the bathroom. Talk is heavy, slow at first but then faster and lighter as the women share stories and thoughts. One woman complains that her husband has stopped using pet names for her. Another talks about how much more her husband used to laugh in Syria. A third describes what it was like to walk across the border, pregnant and afraid. Her four-month-old baby, born in Zarqa, blinks through long lashes at the circle. “Her name is Sham,” the mother says, speaking the Arabic name for Greater Syria as if she can taste it on her tongue. 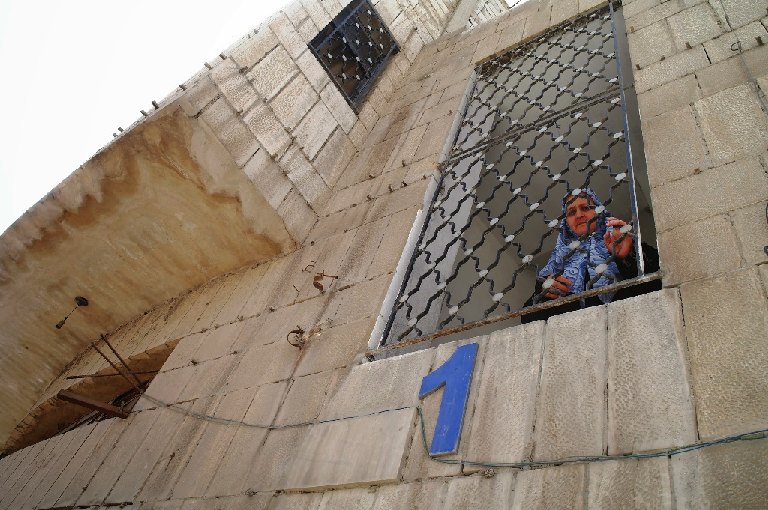 A woman looks out of her window in Zarqa, an industrial city in Jordan that hosts many Palestinian and Syrian refugees. Psychosocial work with refugees is difficult, Darras says. The war is so big, the circle of women so small. Can a mountain of strawberries stand against children’s nightmares of bombs, soldiers breaking into one’s basement, the dirty water of Zaatari and surprise of becoming a refugee? Can group counseling really heal when one’s world is ripped so sharply apart? 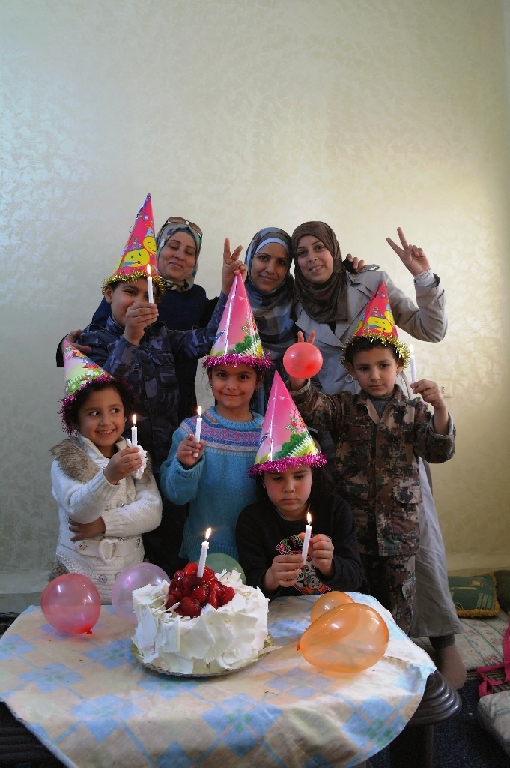 Three Syrian women and their children have a party as part of a psychosocial support program in Zarqa, Jordan. She pauses, watching as the kids rub balloons on their hair and stick them to the wall, giggling at the static. “We have nothing in Zarqa,” she says, “Except for each other.” It’s not much. But in the moment, it’s enough. Alice Su (@aliceysu) is a journalist based in Amman, Jordan. Her work focuses on migration, religion, China and the Middle East.